For the fourth time, De Biotoop – the creative fastcooker in Haren invites you at the annual open studios. Over 100 visual artists, artisans, designers and cultural innovators open their doors for one day to show the public their work. There are sculptors, painters, graphic artists, designers, web designers, photographers, furniture makers, musicians, yoga studios, theater makers, architects and a beer brewer. During the open day performances take place indoors and outdoors and also the greenhouse and the parma culture garden are accessible to the public. The open day is also the opportunity to walk through the various buildings and the eight hectares of nature on the site of the former Biological Center. 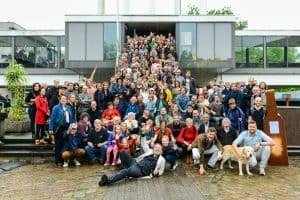 With more than 300 people living and working here, De Biotoop has become the biggest ‘creative fastcooker’ in northern Netherlands. Special children’s activities are around the tipi at the open greenhouse. Children can make syrup themselves. Build their own tipi or cottage of sticks, loam and dust. Or play on a natural marble circuit. The restaurant Vleugel F with terrace is open. The open greenhouse with tea garden bakes pizzas and flamkuchen. And of course you can taste our home brewed beer!